You Supply The People And We'll Supply The Fun! We are an approved Vendor for all of the Palm Beach and Port St Lucie County Parks and Schools! As well as most CIty and Village Parks! Kids Bounce 4 Fun is not only fully licensed and insured but offers brand new party equipment for birthday parties, BBQs, Carnivals, Corporate Events, Fund Raisers, College and Sports Events. Just for fun, consider a Kids Bounce 4 Fun rental for your store grand opening, car dealership or family reunion! 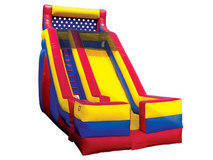 We have a special collection of bounce houses and water slides that can make your kids of all ages enjoy themselves. 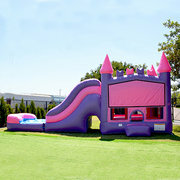 KB4F offers Dora the Explorer Bouncers, Spiderman bounce house, Superman moonwalks, Princess castle bounce houses, Finding Nemo Moonwalk, SpongeBob bounce houses, Fun House bounce houses, Castle Moonwalks, and our most popular Inflatable, the Tropical Water Slide. 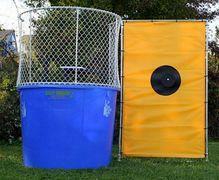 Check out the great combo bouncers, dunk tanks and inflatable slides that can be used wet or dry depending on the weather. Kids Bounce 4 Fun offers you a friendly, reliable staff, and low rental rates to keep you coming back year after year! Reserving your party rental equipment and attractions has never been easier with our new online reservations system. Simply click the link below and enter the date and time of your event. Then as you browse all the exciting rental items at KidsBounce4Fun.com, you'll be presented with those items available on your selected date. When you find items you'd like to rent, just click the "Add to Cart" button located on every product page. Select Checkout and you're just a few clicks away from a completed, confirmed reservation. Let's get your party started now! The ultimate event people mover, that's fun for all ages! 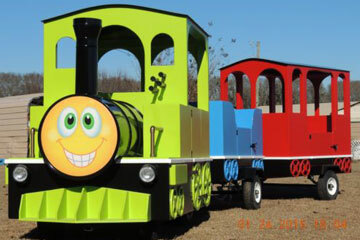 Our Trackless train is perfect for school and church carnivals, gated communities, company picnics and so much more. Comes with an Attendant/Conductor and seats up to 16 children or 8 adults. Has an MP3 player for your choice of music. Add a ride along Character such as Mickey or Minnie (or both) for added fun. 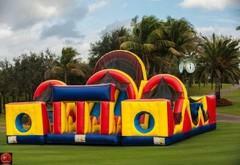 Obstacle course rentals are great for large events, community festivals, school and church carnivals. These large inflatables bring your guests together as they race through tunnels, navigate popup obstacles, and take on the challenge of a climbing wall with cool sliding finish. 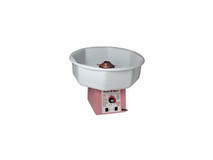 Great for all ages and makes the perfect centerpiece attraction. 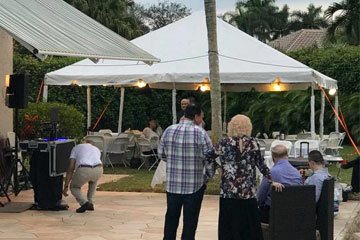 KidsBounce4Fun.com has a great selection of classic tent styles, and tables & chairs that will help you create awesome outdoor celebration spaces that will make you look like a "Party Pro"! Whether it's a small backyard family gathering or large company meeting, we have canopies and seating configurations that will meet your requirements. 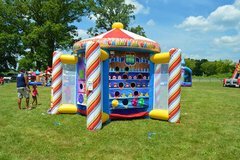 Kids Bounce 4 Fun carries a full line of character bounce houses, moonwalk rentals, bounce castles, bouncing fun houses, inflatable water slides, and obstacle courses. 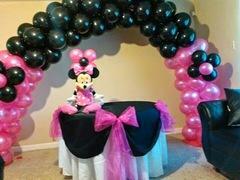 For Birthday party cartoon character themes please ask for what you need if you do not see it! You can find Fun Food, Chairs & Tables, and everything you need to make your event the most fun your kids have ever had by Kids Bounce 4 Fun. 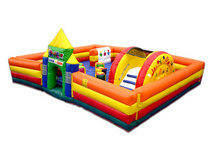 Kids Bounce 4 Fun Offers free delivery in most areas with no hidden fees. 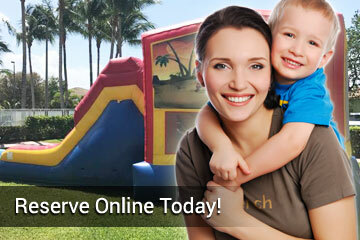 Thank you for giving us the opportunity to show you why we are the #1 Bounce House Rental Company in South Florida. 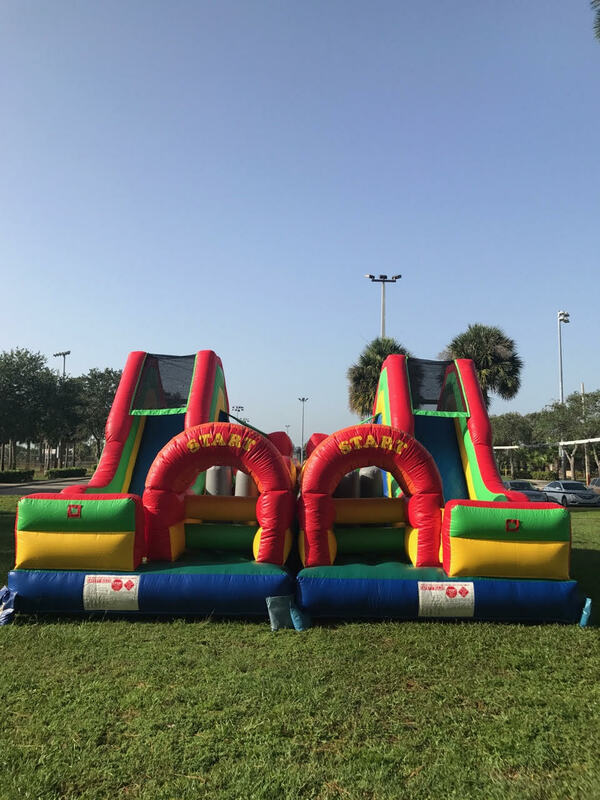 Kids Bounce 4 Fun serves Wellington, West Palm Beach, Palm Springs, Delray Beach, Boynton Beach, Palm Beach Gardens, Jupiter, Hobe Sound, Royal Palm Beach, Juno Beach, Lantana, Hypoluxo, Lake Worth, Greenacres, Riviera Beach, Loxahatchee, Tequesta, Singer Island, North Palm Beach, Boca Raton, Port St Lucie and most of the Palm Beach, Martin County, and St Lucie Counties..